This postcard of the Pin-Ton candy store, 427 S. Broadway, has been listed on EBay as Buy It Now for $29.97. March 4, 1909: How about an ice cream and a stop at the occult bookshop? The Pin-Ton appears to have opened about 1909, judging by ads in The Times, and continued until about 1918. By 1919, it was Remick Song and Gift Shop. A search in the assessor’s records shows nothing for 427 S. Broadway, but lists a building at 425 S. Broadway with a construction date of 1932/36. 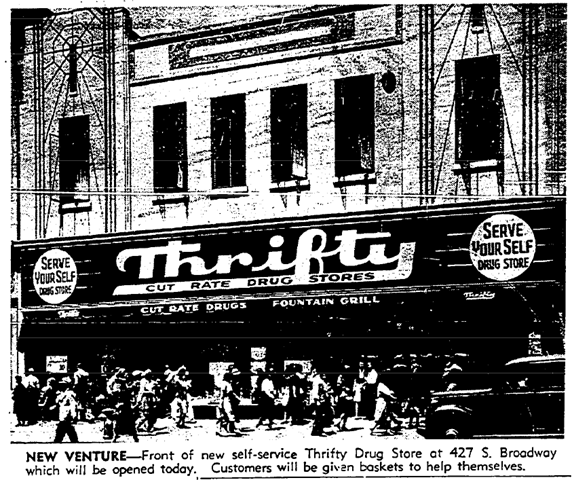 Aug. 12, 1942: The site of the Pin Ton became a Thrifty drugstore and introduced a new concept – self-service. Thrifty extensively remodeled the building in 1954, The Times says. And here is the building, stripped of most architectural details, as shown by Google Street View. And yes, it’s labeled 425 S. Broadway. This entry was posted in 1909, Architecture, Downtown, Food and Drink, Found on EBay and tagged #DTLA, #EBay, 213, architecture, Broadway. Bookmark the permalink. It never ceases to amaze me how the same location can change so much in a relatively short time. Who among us would be able to meander downtown in 1900 without landmarks and different street names?